Nearly failed on day 2. But I didn’t. Anyway this script allows your equipment to level up in battles. Either using EXP or AP. i’m geting an error on “class Game_CustomEquip < Game_BaseItem", it says that the name is rong, any help plz? What other scripts are you using? Also just to make sure you have this script below the individual equipment script? yes I have, I only use this scrips and Yanfly scripts. This script shows the lvl of the equip/wep but they don’t lvl up :S any clue? Not sure off hand. The easiest way for me to help would be if I could get a copy of your scripts file. If not list which of YF’s scripts you are using and I’ll take a look. Very odd, did you accidently paste it twice? Have you got them in the wrong order? I’m really sorry then but I don’t know what I can do. I can’t replicate the error. In a clean project it should work fine. If you want to send me a clean project which has the error I can have a look. Hey man great script but I was wondering how do you change how much ap it takes to level up a weapon? At the moment, no Weapon or Armor gains lvl ups. And I don’t know how to get your ATB/CTB working. I got no errors, I got nothing. Just the default normal battle system. Are you adding the scripts correctly? Yes, I did. At the end of a battle it says that the Party gained AP and my Armors and Weapons do have lvl’s. But that’s it. If you make a fight give thousands of AP does the equipment level? I use a Action battle system and the exp gain not works. Can you give me an evenement line script to add exp. (A script line who works in evenement). Sorry for my english, I’m a french. It should work (unless you are using the AP System)? Link me to the Action battle system. I’ll have a look when I get a chance. I use Sapphire Action System IV, and I just prefer to give experience only at the weapon. I’ve got some free time at last. Could you link me to a copy of the script and then I’ll have a look or upload a project with the scripts either will do. Can you make this compatible with victory aftermath? Have you tried both scripts both ways round? Was curious, is there a way to negate exp gained by the weapons except by a script call? And if so, what would that script call be? I plan on using this for forging and would work pretty good. Then as for a script call, you would need to get the individual weapon and call the gain_exp method on it. Fomar, is there any way to change the exp system not with exp but with how often it is used in battle? Is there a way to add a tag for the equipement I want to level or not ? You could set the max level to 1. How do you make it so that only specific weapons level up? But it does mean that every other weapon will show up as level 1. Ah it treated my tag as html. No, it doesn’t. Already tried that. Maybe I should mention, that I’m using the Ap System I, because I don’t know how II works. Put something like: in the note box on the enemies you’re fighting. Okey, now i was fighting 5 enemies and everyone gave 1000 AP, together 5000. Now my equip DID lvl up, but they were not on the same lvl.. But I don’t see how I can change that with it. Sorry to bother you so much. And it won’t work, even when I get 3000 AP per fight. It should, I’m not sure what’s wrong. If you upload a copy of the project I’ll have a look. Sorry, verification on mediafire takes a long time. I will post the link as soon as it’s finished. And perhaps you could tell me, why the CTB is not working. Sorry I had to approve it because of the link in it. Don’t worry I deleted the duplicates. The scripts are in the wrong order. Also the CTB worked fine, what made you think it didn’t work? Oh, okey, I try that one. Because the standard KS from Ace is the KS I’m fighting with, although I have installed the CTB. So no Sideview etc. at my version. The CTB isn’t a Sideview battle system. Do I need different sprites for my charakters than the normal ones? because when I use the normal ones for example my charakter Fynn, I have to name it Fynn_battler. That worked, but it looks very weird and they are wrong placed. If you’re using the basic side view one you need to cut out the battlers. Thank you for your great support, you were a big help! No problem. Holder has loads of sprite sheets. By default the script is set up to use hers. Hey Fomar. I had intended on using common events to trigger equipment level ups. What code would I use in a common event to make a specific weapon level up? Also, could you explain how to set the attack power of the weapons for each individual level? It seems as though there’s some kind of formula in the script, but I wouldn’t know where to look. Would there be only one instance of the weapon? or would someone have it equipped? to edit the growth or the weapons. Both. Someone will have it equipped, but there won’t be any duplicates of the weapon available in the game. Also, thank you for the quick response. Can you make a compatibility patch for Yanfly Ace shop option please ? I’ve already tried to pu your script before Yanfly script but it didn’t help. Here’s the error I got, it’s from Yanfly script but when I remove your script his script work. I hope it can be solved. And probably if you removed his script then mine would work! Sorry but I have no interest in making a compatibility patch. The AP needed is based on the Equipment’s stats. Is the weapon much more powerful than the armour? am I doing something wrong? should I change something?? into a new project and see if they work. Script ‘Individual Equipment’ line 36: TypeError occured. Is there anything you could tell me to get this to work? I am very eager to test this script with my game. Thank you! My scripts are all for RPG Maker VX Ace, sorry. Hi there I know this is probably a very easy question to answer but I have this script but I fight 1 slime and all items and equipment level up to 5 :/ I am useless with scripts where do I change to have them level much longer. Hi, My problem is for some reason my weapons don’t level up but I had tried making it the same stats as my armor and then it leveled up but when I switched the weapons stats back and tried it the weapon didn’t level up only the armor. Is there any way to fix this? or is this something that was implemented in the script? Can you explain to me how to use your AP system with this script please ? For example, where do I write this ? Second question, can you explan to me this formula ? It’s in percentage or what is it ? performance is basically the strength of the weapon or armour. It’s all it’s stat gains added up but on a weapon str and mat are worth double and on an armour def and mdf are worth double. So if I understand well : the stat I setup in database double everytime the weapon level up, that’s it ? So what does the “*10″ stand for ? Sorry for my bad english I just trying how to understand your formula so I can customize it to my taste. I don’t know if it will be possible but I would like to know also if there is a way to control how much exp and stat an equipement can gain. *10 means multiplied by 10.
is how much stronger a weapon gets on level up. By default a weapon at level 5 is twice as strong as a weapon at level 1.
when I unequip two equipement (lvl up or not), I can’t equip again the first one I unequiped. Do you have any other scripts? Just I use this is my game and I don’t have that problem. Just tried the scripts. There is one big flaw. Equipments of reserve members also do level up. Yes if they are set to receive experience when in reserve then their weapons do as well. This was intentional. Whenever I use this script with Yanfly’s Victory Aftermath the level up text is just inserted in the loot screen. How do I fix this. And this doesn’t seem to work with Yanfly’s Equip Engine either, because whenever I remove a piece of equipment it is not in my inventory. This and Yanfly’s Equip Engine are not compatible. Then it won’t show up in the loot window. 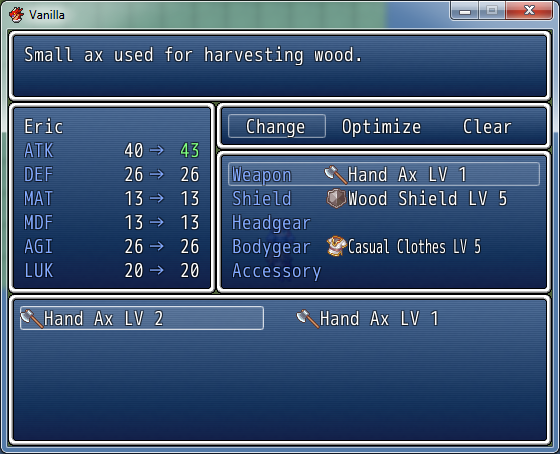 You’ll have to add something to show the player that the equipment have levelled up though. Should I give you my project so you can see what’s wrong? No I’m not willing to go through all those scripts and fix the compatibility issues. RGSS3, I might one day repost my RGSS (1) scripts but that involves me tracking them down. Same thing with my RGSS2 scripts (which are far fewer). how do I increase the amount of exp needed to level up each weapon? Sorry I must have missed this comment, I’ll fix it when I get a chance. I have an accessory that teaches a magic skill. When that item levels up to level 2, it is possible that the item then teaches the next tier of that magic? Absolutely fantastic. Thank you for the link. I didn’t see Equipment Skills by Level on the master script list, so I wasn’t aware it existed. Hello! I was wondering if there was a way to manually add a level to a weapon. I’m planning on making a blacksmith shop and this script would be PERFECT if I could just manually for a level up to a weapon or armor. Can you tell me how I would do this? I just don’t know what I would type for script call? Is it like a way of buying exp for currently equipped weapons? Lvl 2 is 1,000G, Lvl 3 is 5,000G, Lvl 4 is 10,000G, and Lvl 5 is 25,000G. I was thinking about implementing just buying AP at a shop but I don’t know how to read the code to tell how much AP is needed for each level, plus if I were to buy at the shop wouldnt it add the AP to all the characters. I’m trying to do it one person at a time. So far it’s working perfectly! Thank you so much, you’re awesome! So the code works great when I use Y as a constant number, how would I implement Y as a variable. Right now I have $game_actors.gain_ap(\v) but it gives me a syntax error. I realize now that \v only works with the messaging system, so how do I call a variable in a script? i just have a question: are the exp actualy stored for the equipment? cause i had some problems with a sub class script where the subclasses got exp but the exp didnt get stored anywhere, so i needed at least the amount of exp for the next lv to lvl them up and i dont want that kind of problem again. ohh yea and also because the items are written as x0 they dont appear in my inventory, any way i can go around this? Sounds like some weird script clashes. I would LOVE if u could make another way to level the equipment… like the weapons level up after u attack 10 times and armor levels up after enemy hits ya ten times then they scale, more hits required for higher levels.. i seen a script for stats to level that way but makin the equipment leveling that way would be much cooler. Hey Fomar, that script is awesome, it works perfectly on my computer. However, there’s is something I would do, and I don’t know how : is it possible to remove, for the WEAPONS, the “atk and mat count as 2 time bigger than the other stats” ? Just to be sure we are talking about the Optimise option in the equipment scene? You mean, the “Optimise option” that takes the most recommanded equipments in the inventary when the player uses it ? For any WEAPON, not armors, with your script, the EXP needed is “the performance of the weapon”. However, if I take a weapon which have the stat +30 to DEFENSE, I’ll have 50% of the needed XP than if I take a weapon which have the stat +30 ATTACK or +30 MAGIC ATTACK. How would I check to see if Actor 1 Weapon level = 5? I’m noticing that once a weapon is leveled up to lvl 5 they can keep purchasing ap. I wanted to make it so the NPC would realize to tell them no, actor 1′s weapon can not be improved. Hey I noticed you could make it so only one item levels. Can you explain how to do a few things? Second, how can I take off the Level 1 from every item? My equipment still wont level up. I do have yanfly’s victory aftermath….would this interfere with the script? Do I have to manually lvl up my weapons or is it automatic? I was wondering if you would be willing to help me again. I’ve almost got the Blacksmith script set up, but I need one final command that I can’t seem to figure out. So far the Blacksmith improves a weapon’s AP based off of a variable of the characters level. It works perfectly, however, once I reach level 5 with the weapons, you can continue to purchase AP for the weapon even though it can no longer be improved. Can you please tell me what the script would be to check to see if Actor 1′s weapon = Level 5? I was wondering if you would be able to help me again. So far it’s great, the player goes up to the NPC and is able to do dialog, choose player to improve the weapon, and it’s cost and improvment total is based off of a variable of the players level. The only problem I’m seeing is once the weapon reaches the max level, the player is still able to buy AP for it even though it can no longer be improved. I’ve been trying to get it to work for a few days now but I can’t figure out the script to check to see if Actor 1 weapon level = 5. Would you please be able to help me? Thank you in advance. Is there a way to customize the max limit of exp or ap of any equipment (that can be inputted on the Notes section)? For example, at Level 1 for 500 then Level 2 2000 and Level 3 10000.
shagans on How to make the most of custom formulae. Dekita-RPG on How to make the most of custom formulae. Xypher on How to make the most of custom formulae. Phantominoid on How to make the most of custom formulae.